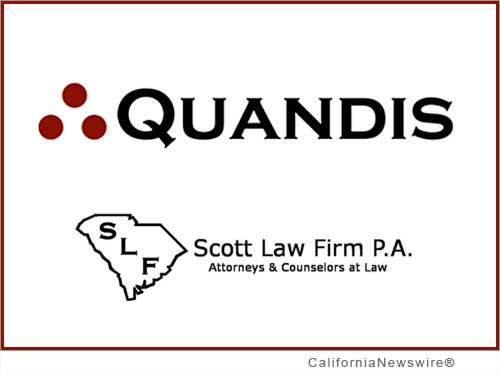 FOOTHILL RANCH, Calif. /California Newswire/ — Quandis, Inc., a leading provider of mortgage servicing software, today announced that Scott Law Firm, which serves the default servicing industry, is actively utilizing its new military search name permutation functionality. Scott Law Firm can now more easily and efficiently identify active duty military borrowers in the DoD database to comply with the Servicemembers Civil Relief Act. "Checking the military status of borrowers holding mortgages is a responsibility that we at the law firm take very seriously," stated Reginald P. Corley, managing attorney of Scott Law Firm, P.A. "It is critical that our team perform accurate searches in the DoD database each and every time. Given the rapid scalability of Scott Law Firm systems, Quandis custom-configured searches for all name variations to be performed at every client-specific mandated milestone, ensuring compliance and quality service for our client base." The addition of Quandis' name permutation searches creates a comprehensive, advanced compliance solution that helps adhere to the SCRA by fully automating all aspects of DoD searches. Benefits of the automation include better, quicker and more accurate searches; increased employee productivity; and risk mitigation. "We are pleased to announce that Scott Law Firm is the first law firm in the nation that Quandis helped to automate the running of DoD search permutations of all alias last names," commented Scott Stoddard, CEO of Quandis. "They have been an outstanding group to work with on this exciting and innovative project." Quandis customized name permutation searches to meet Scott Law's specific client needs. The solution also integrates with Scott Law's case management system (CMS), CaseAware, seamlessly returning search findings back into the system along with the DoD's official military status report. As a result, significant time is saved and the potential for data re-entry errors is eliminated. In conjunction with CMS integrations, Quandis offers the most powerful and extensive searches in the mortgage banking industry. Founded in 2003 and headquartered in Foothill Ranch, California, Quandis is a mortgage servicing software company specializing in Web-based solutions for the mortgage banking industry. Quandis' solutions include foreclosure process automation, valuation software, military search services, bankruptcy searches, short sale portals, skip tracing systems, collection solutions, vendor solutions, as well custom application development. The company's clients range from servicers to foreclosure attorneys, lenders, banks, GSEs, outsourced service providers, and agents and brokers. For more information, please visit http://www.quandis.com/ or call (949) 525-9000. The Scott Law Firm P.A. offers statewide representation in South Carolina to lenders and lender representatives and all legal services are rendered in compliance with FHA/VA/FNMA/FHLMC guidelines and reimbursement schedules where applicable. The Scott Law Firm appears in the Martindale-Hubbell Bar Register of Preeminent Lawyers(R) in the following disciplines and areas of practice: Bankruptcy Law, Creditors Rights, Legislative Practice and Real Estate. The Firm is only 1 out of 15 law firms across the country to be selected for a Tier 1 Metropolitan Rating in mortgage banking foreclosure law by U.S. News & World Report. Visit the firm's website for more information http://www.scottlaw.com/ .